Healthy Mom is on a budget! Are you a mom on a budget? Walking into the grocery store can sometimes be daunting. It can be so challenging when your list is long and your funds are limited, and there are still a few days remaining before the next check comes in. You can do it! Momma bear is on a hunt for her cubs, and they will not be denied! How about the candy aisle? As a mom on a budget, you know that is not going to happen. Forget the candy aisle! There are so many other items that are necessary, forget the junky stuff. How about a HEALTHY mom on a budget. I guess the answer to that one is obvious as well. A mother who is concerned with trying to purchase the most healthy nutritious foods for her family will stay away from the candy aisle. This last week as I was walking through the cereal aisle at the local grocery store, I couldn’t help but think. There is more than one candy aisle at the grocery store. They should rename it CANDY LAND, just add milk. I hate picking on a particular cereal, most of them are pretty bad. One that caught my eye was KIX, Kid-Tested, Mother approved. As a family through the years, I know that this is one of the tamer ones that we have purchased. Just out of curiosity I went to read the label of ingredients. Wow, that was an eye-opener. All I could think was, CANDY LAND!! Just a few others that I would put on the CANDY LAND list would be Cheerios, Honey Nut Cheerios, Kellogg’s Corn Flakes, Kellogg’s Mini Wheats, Apple Jacks, Cocoa Puffs, Lucky Charms. Chex, Wheaties. I think you get the idea of what I’m trying to say. My wife and daughter were helping me proofread this blog post when they said “Cheerios! Are Cheerios really on the CANDY LAND list?” I answered them emphatically – yes, on my CANDY LAND sugar list. It’s true that some cereals may have a little amount of sugar, and yet it is the number three ingredient listed on the Cheerios box. This viewpoint may seem extreme, but I’m drawing my line in the sand. Any cereal with sugar in the ingredients are on the CANDY LAND list and they should not be eaten, and should not be fed to our children. As many of you know, we have discussed phytic acid and teeth. If you are interested is knowing more about phytic acid please read here. Even though in that blog I said that in general phytic acid rich foods are good for you, wouldn’t you know it, foods from CANDY LAND are loaded with phytic acid. Ugh. For you moms out there that love reading on this subject may I recommend: Salt Sugar Fat: How the Food Giants Hooked Us by Michael Moss. What a great book. The book is a real eye-opener on the thought process behind processed foods. Maybe we are better off going with a simpler diet, going back to the basics, garden food, non processed foods, no sugars, etc. As a dentist, through the years, my standard advice was no in between meals; make sure to use fluoride, brush, and floss. I think my advice is changing. In addition to my old advice, mothers need to keep their kids away from CANDY LAND. That stuff is really unhealthy. Are your kids packing a few more pounds than they should? This could be the answer. I do have one exception with cereal from CANDY LAND. If your child is having a birthday, and you want to make it a special day, I think it would be OK for them to have one breakfast from CANDY LAND. That is the only time that I can think of where it might be acceptable for them to eat this stuff. Once a year. If it’s not their birthday, they don’t get any. So this week, while shopping, ask yourself, any birthdays in the family? If not, that makes it easy- just skip the CANDY LAND aisle. 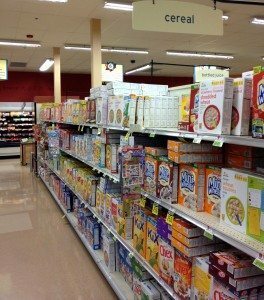 I wish I could make a fast and easy rule and say that everything on the cereal aisle is junk. As usual, it’s never that easy. While walking through the aisle I did see Quaker Oats. That’s nutritious. Oatmeal is good for you! Not only that but it’s so easy to prepare. I love recipes that start with boiling water. If the budget allows, add a little fruit. That breakfast is downright perfect. Send them off to school. Not only should they be able to get to lunchtime without any hunger, which also means no in-between meal snacks, they will be able to think and focus on their maximum. Not only do we at Seasons of Smiles Dental love beautiful healthy teeth, we want our beautiful kids to be healthy as well. If you have any questions or concerns for your family’s teeth give us a call at 236-4740. WOW! Cheerios..??? That one really surprised me! I do eat them occasionally, but my almost every day is Oatmeal(and I make my own, sometimes with fruit. But, I guess i can see how cheerios would have sugar, the only thing I ever put in them is maybe a banana. That should have told me something. Thanks for your blog..really interesting to read. I think oatmeal is a great breakfast. Thanks for coming by and leaving a comment.